The 7-6 Celtics take on the 4-9 Chicago Bulls at TD Garden on Wednesday, and the schedule is starting to ease up a bit. Boston has a 3-game home stretch against the Bulls, Raptors and Jazz, then face the Hornets (away), Knicks (home), Hawks, Mavericks and Pelicans (all three away) - until coming back home against the Cavaliers on November 30th. It is time for this team to get it together. Boston had a 4-game win streak at the end of October against the Thunder, Pistons (two games) and Bucks. The Celtics desperately need a win versus Chicago, and while Toronto and Utah pose a threat, the Celtics home-cooking may work in their favor. Gordon Hayward will certainly get a better reception in Boston than he did in Utah. 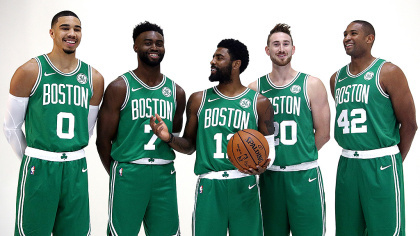 For those readers participating in our Celtics Race-to-the Title contest, and for those that are not aware of it, we are expanding it to give participants a chance to add points to their totals. We are looking for the Celtics next 3-game winning streak (what specific three-games-in-a-row will the Celtics win) and the total point differential for the three games. For example, Bulls (4-point win), Raptors (12-point win), Jazz (16-point win) equals a total differential of 32 points. So you have to pick the right 3-game streak AND the total point-differential of the three games. Whether contest veteran or newcomer, just click on the Celtics Race-to-the-Title link above - pick the 3-game streak - and give a number for the total point-differential. Submit your answer prior to 6:00 PM ET on Wednesday prior to the next game. And feel free to join the Celtics-vs.-Chicago contest via the same link. Let's hope this home stand, and maybe some minor line-up changes, may turn things around.